Mana Wraith into Splintergraft maybe? I assume this is still not going to be a thing even with The Marsh Queen? I just watched this video, and realized how good this could be as an anti-aggro tool if it had good cost-stat distribution. Please Blizzard. All i want for the next expansion is a 1 mana 1/3 version of this. or 2 mana 1/4, whatever. Tbh this is an underlooked and underrated card. 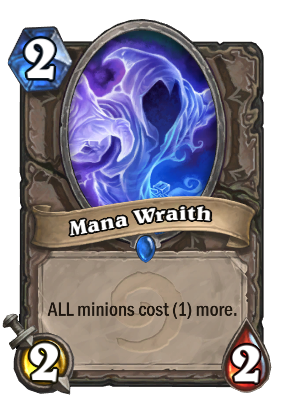 Reason is p simple, a 2 mana card shld be either 2/3 or 3/2 on average, and card increases cost 4 ur other minions, disrupting a gud mana curve. This disrupts the opponents mana curve too, doe,since when used with The Coin or mana generating cards on Turn 2, Unless the oppoent has been saving a 1 mana card or just drew it, which is unlikely, they would b unable to do anything other than use their hero power. The effect is much greater on Turn 1, due to obvious reasons. This can put the opponent under pressure, while this minion can whack face many times before needing to trade minions. Might see a bit of play at 2/3 as a counter to aggro decks, maybe. Just understated as is, especially with a hurts both ability. I think this card is pretty solid in current meta. For example: putting him on the empty bord prevents C"thun, Yogg, or N"zoth from dropping. And it kills combo decks like Worgen OTK, cause worgen will cost 4 mana and faceless manipulator 6 mana. As you can see, it,s not that bad. I'm suddenly wondering if this card might be a way of delaying C'Thun for a turn in Standard. Drop it on turn 9/10 on an empty board or behind a Taunt and you're pretty much guaranteed to prevent an Old God from dropping next turn. (Obviously in Wild Nerub'ar Weblord is an even better option for this.) It would be a very tech based choice though given the crappy body and the fact that it screws you over too. I guess I'm just worried about C'Thun, he looks ridiculously OP to me at the moment, I hope I'm wrong! I LOVE THIS CARD. I'm surprised it's getting so much hate. It's rad on Pali, Shaman because you can just hero power summon out. It shuts down mages and their stupid +1 hero power DMG, Mana Wyrm, Pint-Sized Summoner, jerk openers. I have even coined this out on turn one, hero power on turn two, then turn three you can Sword of Justice, Powermace, Coghammer, Far Sight, Feral Spirit, Muster for Battle, Seal of Champions. After that they either find a way to kill it and you can just drop a Piloted Shredder, or Arcane Nullifier X-21 like normal (which is EXTRA nasty if you happened to get the Sword of Justice or Powermace out). If they don't have an instant removal, it stalls the start of the game to turn 4. And if they DO have an instant removal before turn 3, then you just forced them to burn a Slam, Darkbomb, Crackle, Flamecannon, Frostbolt WHATEVER on a 2 cost minion. Mage can use hero power on both turn 2 and 3 to get rid of it leaving you at a full regular turn 4 again and them with nothing on the board. I don't think this is an early card... If you play it turn 5 you might stop Tharussian. If you play two of them late game you can make some cards unplayable like Ysera. Just kidding, it's terrible. The concept is good but the stats on this card are too weak. It'll never work in constructed and it's a "no other options" pick in arena that might help in some strange 1/100,000 chance scenario where it stalls a taunt or something. A very fun anti-rush card. He is rather fragile though to hero powers, but if this guy draws removal or two hero powers, he has delayed your opponent at least by a turn of dropping new minions early on. He absolutely shines in priest, because the priest has nice buffs(Power Word: Shield and Velen's Chosen) and can keep him around with his hero power. The effect looks symmetrical, but it isn't. If you are playing him, you have built your deck to get around his effect. And you get to play cards before you drop him. If you play him early, your opponent will need to kill him by playing removal on him or pay the tax for his creatures. That means that you will be the first to play without the tax in most cases. That said, this guy really needs another copy of himself. Naxxramas gave us the Nerub'ar Weblord, but that one power loss and slightly more specific tax makes him a lesser version of this guy to me. You should use this if you have a spell heavy deck. Not used too much. More useful if you are up against a zoo deck then other decks. Low 2 value, and affects self. Its an Early card, to stop decks from pulling out low lvl cards quickly. Why would I even use that card ? Am I missing something here ?